One of the most popular and sought-after home styles in the United States is the European-style plan—a design that evokes the splendor of the Old World and eclectic charm of the European continent. From an English cottage to a Tudor home, a Mediterranean or Spanish house to a French-inspired country home, European house plans can be adapted to every region of the U.S. Here, then, is a view of a delightful architectural look that brings together styles from England, France, and Italy. This charming two-story, three-bedroom Tudor country home, with its wood-and-stone facade, features an arched entryway (Plan #146-1662). For people with European roots, a touch of the “Old Country” is always welcome. 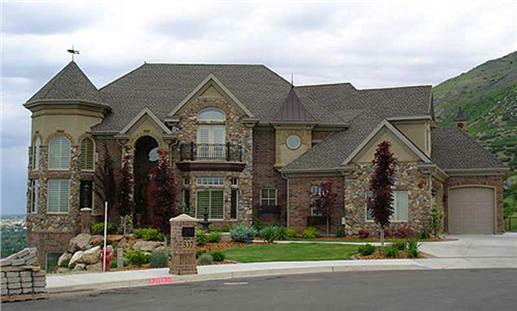 And, if you love steep roofs, mini-towers, turrets, and elaborate woodwork, the European house plan is simply perfect. 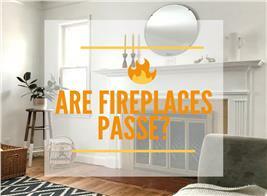 So, which European-style plan really fascinates you and makes you want to build that home right now? Find the sophisticated, elegant, romantic, and rustic captivating? 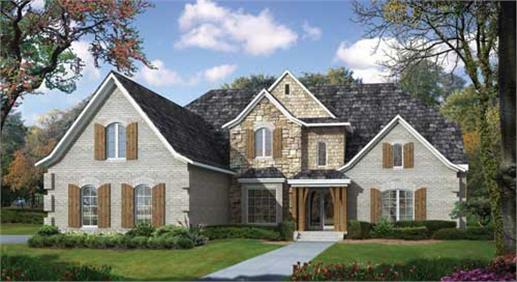 Then you can choose a French-style or French Country home plan. Asymmetrical exteriors and steep rooflines are the distinct characteristics of this French-inspired two-story, five-bedroom country home. 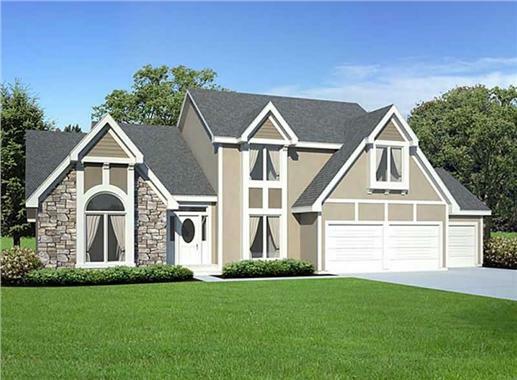 Check out the stucco-and-rock facade (Plan #161-1030). Most French-inspired homes have two floors; asymmetrical exteriors; steep, high roofs; and multi-paned windows. Their exteriors can be a combination of rock, brick, stucco, and wood siding. 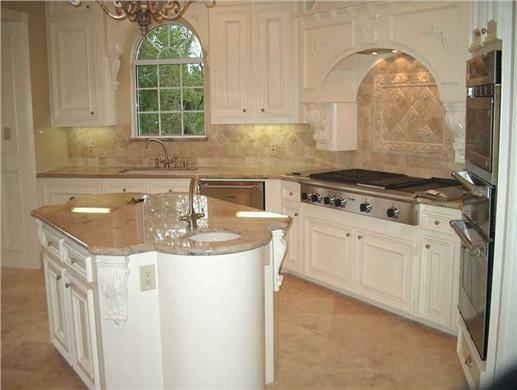 You will also find arches on doors and windows reminiscent of homes in France. Open floor designs reign inside these homes—and complement the high, vaulted ceilings. 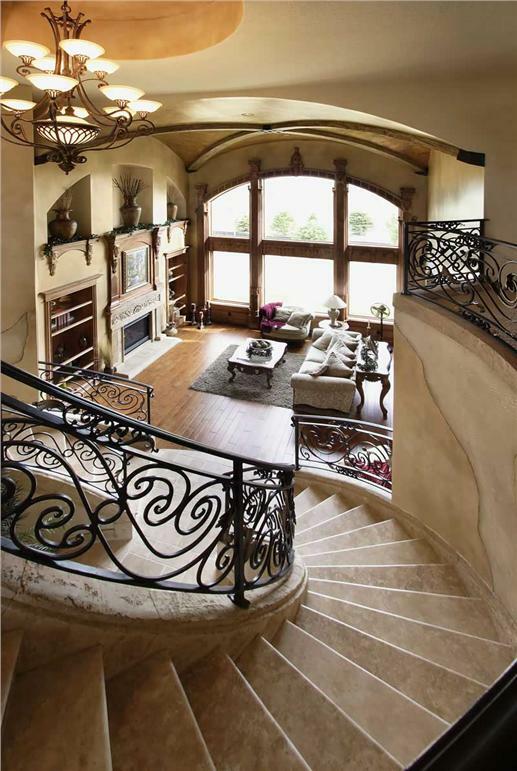 Stairs with meticulously crafted decorative work and fireplaces are prevalent, too. Inside this five-bedroom French-style country home, the open floor layout, wood-rock combinations, and attention to detail highlight its elegance and sophistication (Plan #161-1030). From farmhouses to manors, and even, chateau-style homes, French Country plans in the U.S.—much like the picturesque residences lining the rural French countryside—bring rustic, warm, and cozy touches to the home. The style is about relaxed elegance, comfort, and ease. 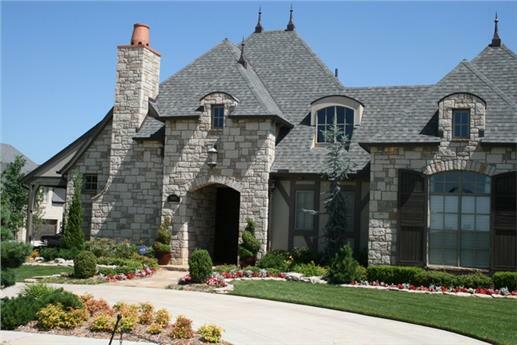 French Country homes come with steep roofs, multiple gables, arches, and brick and/or stucco highlights. They usually have inviting front courtyard entrances and feature tall windows, timber beams, and ornamental trim. And inside, it is like walking into the friendly and homey comfort of a Southern home—all warm, snug, calm, and restful. Feel the tranquility and calm as you walk through the courtyard and watch the rays of the setting sun flickering against the windows of this six-bedroom French Country home (Plan #134-1327). Enjoy the rustic atmosphere of the open floor design—with a high-ceiling Great Room and very comfortable-looking living area. 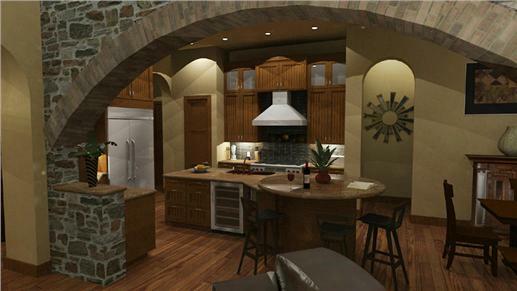 There’s also a modern kitchen with a peninsula/eating bar, nook/breakfast area, and walk-in pantry (Plan #134-1327). 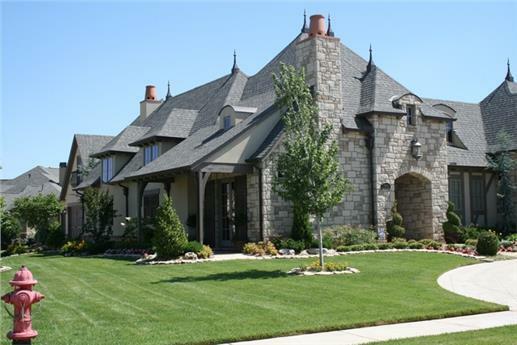 This five-bedroom French Country style home has arches on its doors and windows, multiple roofs with steep lines, and the familiar brick-stone-stucco combination (Plan #161-1022). 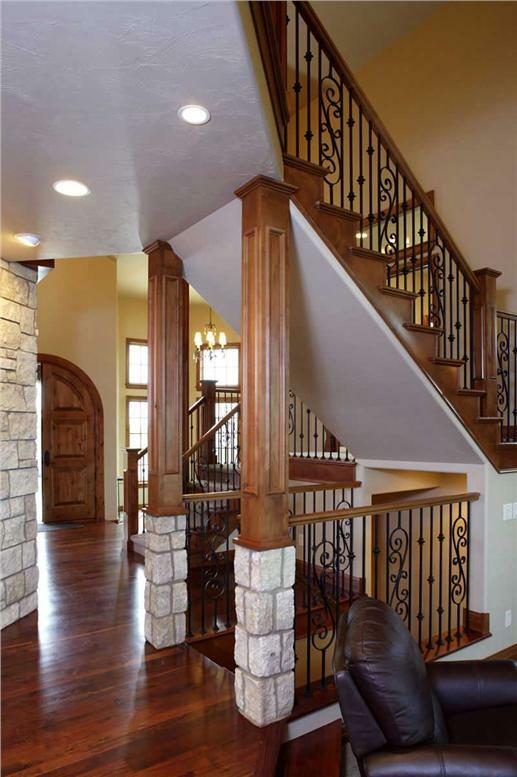 Step inside, and marvel at its modern look: an open floor design and delicately fine wood-iron-stone work on the stairs (Plan #161-1022). For those who love the English countryside and the appeal of William Shakespeare’s native land, a Tudor-style home or an English Manor may be more to your liking. Straight from the land of Shakespeare, this beautifully landscaped two-story three-bedroom Tudor “cottage” features iconic gabled rooflines, stucco exterior, thin windows with wood shutters, and arched entryway (Plan #153-1715). The Tudor home—with its iconic stucco exteriors, steep gabled rooflines, casement windows framed in wood or stone, half-timbered facades, and decorative chimneys—takes you to a fairy-tale world. Imagine secret gardens with colorful flowers or Snow White waiting to peek just beyond that gate. Originally built for wealthy homeowners, Tudor houses eventually found their way into mainstream America, where the style has been updated to a more modern English cottage or an elegant country manor. Here is a more traditional two-story, four bedroom Tudor-style home with the half-timbered exterior, chimney with chimney pot, and gabled roofs. Inside is a spacious Great Room—with kitchen and informal and formal dining rooms—warmed by a big fireplace (Plan #127-1034). Since its adaptation in the U.S., the Tudor home has emerged with a new look. Now more symmetrical, it still features one or two stories but without the half-timbered exteriors. The gabled roof remains the same—and at times, the decorative chimney with chimney pot. Step inside, and the high ceilings are there with a very modern open floor layout. 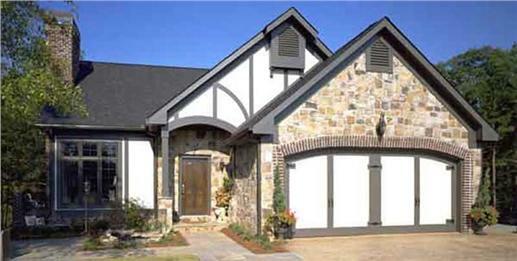 A “new look” Tudor style home is more symmetrical. The stone-stucco facade and hip roofs are mainstays, as are the tall, thin windows. 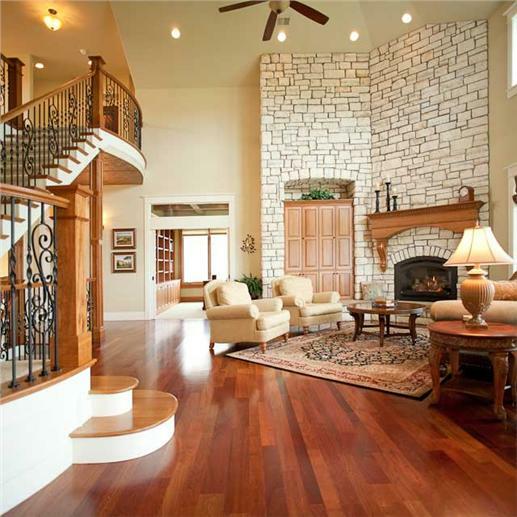 Walk through the foyer into a Great Room with a 10-foot-high ceiling. 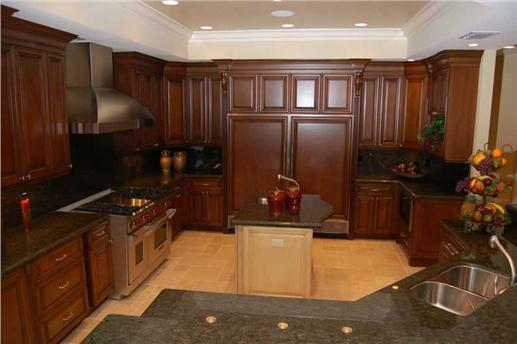 There is an easy flow of traffic between the living, kitchen, hearth, and breakfast areas (Plan #131-1011). Love the world of classic literature and all those gorgeous homes with Grand Halls and picture galleries? Then the bigger English country house or manor may be your style. Think of Longbourn or Netherfield Park in Jane Austen’s Pride and Prejudice. Edgecote Hall, located in one of England’s most beautiful countrysides, was the real “Netherfield Park” in the television version of Jane Austen’s Pride and Prejudice. English Manor home plans—with their courtyards, stone roofs, chimneys, and windows covered with climbing vines—are the epitome of elegant country living. And while quaint and very traditional on the outside, the interiors are 21st century modern, featuring spacious open floor layouts, attractive and state-of-the-art kitchens, and all the amenities and technology one would love to have in a home. This rendering of an English Manor-style home depicts a delightful mix of brick-stone exteriors, steep gables, and arched windows. The two-story home has five bedrooms with an option for a sixth above the three-car garage, four bathrooms, and a den. The covered front porch leads to a huge open space that includes a dining area, kitchen, family room, and fireplace (Plan #108-1619). 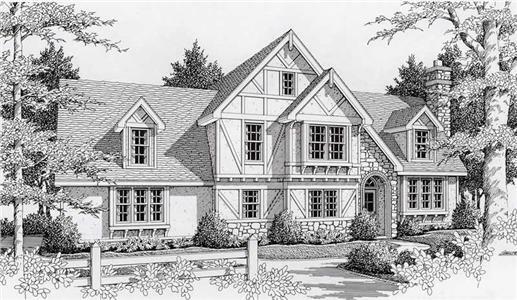 The delightful hallmarks of an English Tudor Manor-style home—rock-stone-stucco exterior, gabled roofs, small-paned windows, and chimney—are evident in the rendering of this two-story plan. All of the social spaces are on the first floor—kitchen, dining room, family-living rooms, a den-guest room, and two fireplaces. The bedrooms are on the second floor for the utmost privacy. 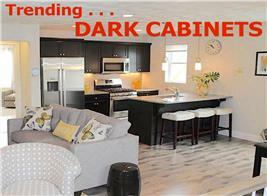 There is a bonus room and unfinished basement for additional expansion (Plan #162-1017). 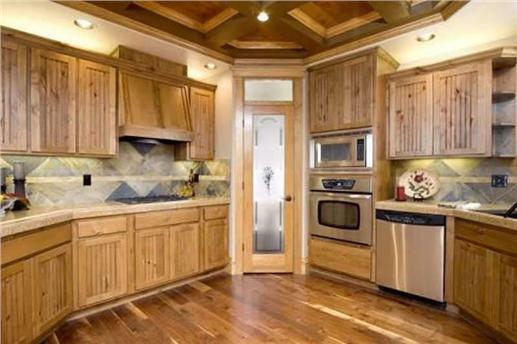 Inside a Tudor-style home is this very modern and well-appointed kitchen (Plan #149-1158). Perhaps you can’t forget that lovely home in Greece overlooking the Mediterranean Sea—the sunny and breezy one with lots of windows and verandas. Or that warm and cozy rustic home on the Tuscan hillside. Then look closely at Mediterranean/Spanish/Tuscan home styles—with their clean and simple lines, colors, and landscapes. These architectural designs are found around the world and in places with temperate climates. They are popular in California, Florida, Texas, Arizona, and the Southwest. Two views tell it all: from its cobblestone driveway to the terra-cotta tile roof, landscaped courtyard and tall columns, this luxurious two-story, five-bedroom Mediterranean-style house plan has all the curb appeal in the world (Plan #107-1135). 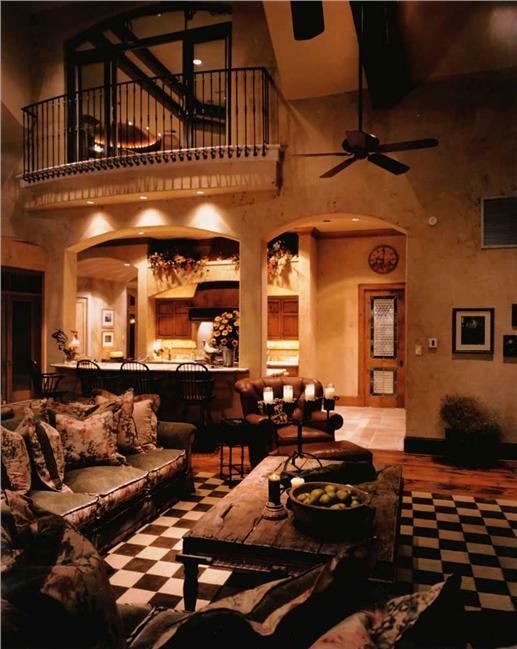 While Mediterranean/Spanish/Tuscan home designs range from the simple to the luxurious and absolutely magnificent—with elaborate woodwork and sometimes lavish features—they maintain their charming combination of the romantic, bold, exotic, and inviting. 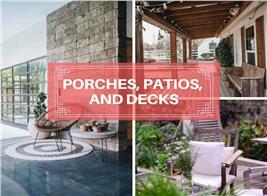 What are the common features of these warm-weather designs? Brown and beige with a hint of yellow pervade the cabinets and floors of this thoroughly modern kitchen (Plan #107-1135). Enjoy the view from the tall, wide windows of this formal living room—again decorated in earth tones (Plan #107-1135). Relax and bask in the sun right by the pool or from one of the second-floor balconies (Plan #107-1135). A two-story, four-bedroom Tuscan-style home showcases earth-tone exteriors, red tile roofs, archways, and a landscaped rear courtyard with a water feature (Plan #117-1093). 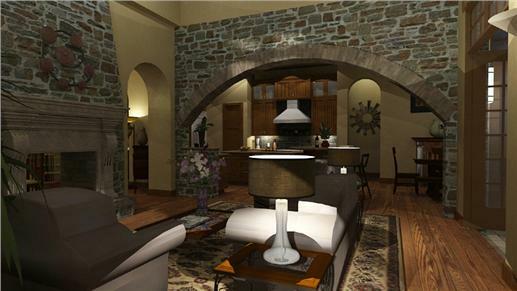 A peek inside shows high ceilings, more archways, walls of stone-stucco combination, and furnishings/fixtures of warm brown and yellow hues in the family room (left) and the kitchen/snack bar/breakfast nook areas (Plan #117-1093). 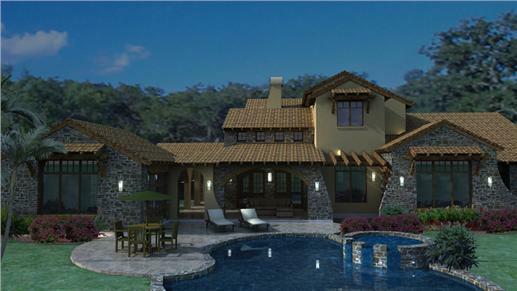 Wait till you view the interior features of this luxurious two-story, five-bedroom traditional Spanish/Tuscan style home (Plan #101-1353). 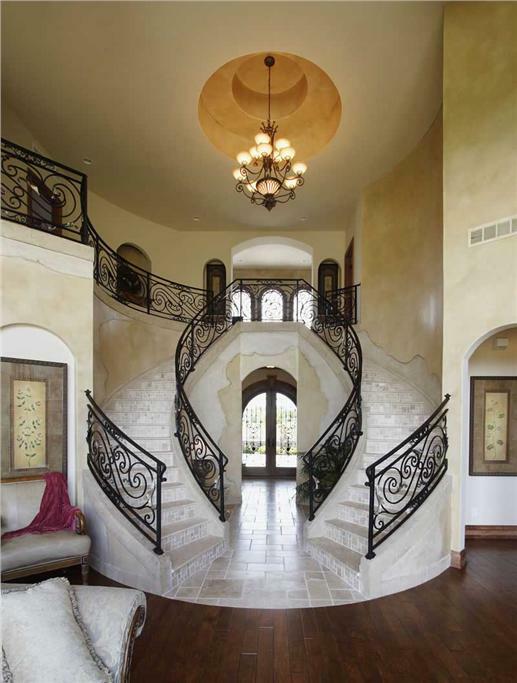 A magnificent circular staircase that would make Scarlett O’Hara blush! 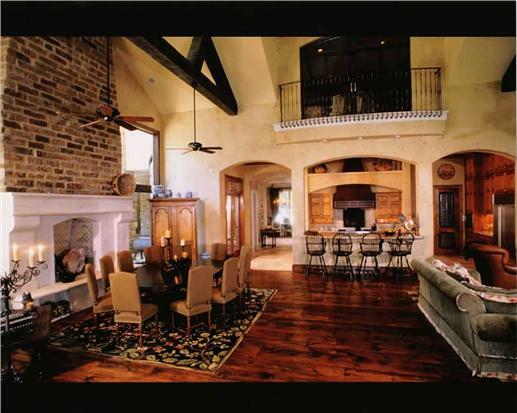 Walk down the steps into this gorgeous, high-ceiling Great Room with the fireplace nestled between cabinets. Colors are calming and relaxing hues of beige-light yellow-brown (Plan #101-1353). If you want to live in a castle like a royal family, then the Chateau-style plan—fanciful and lavish—will work for you. 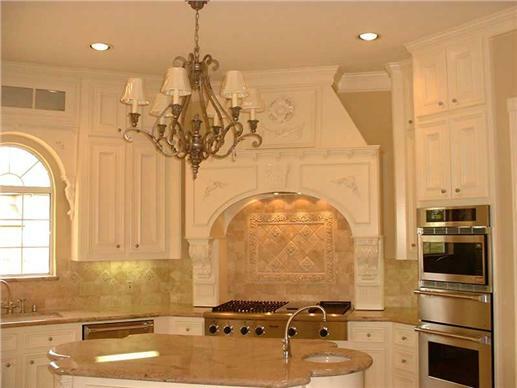 Modeled after 16th century French mansions, this design became popular in the U.S. in the late 1800s and early 1900s. You may find chateau-style homes in upscale neighborhoods—but the design can certainly be adapted for a typical residential area. With almost 5,000 square feet of living space, this French-European home design has four bedrooms and a study, library, and gallery. 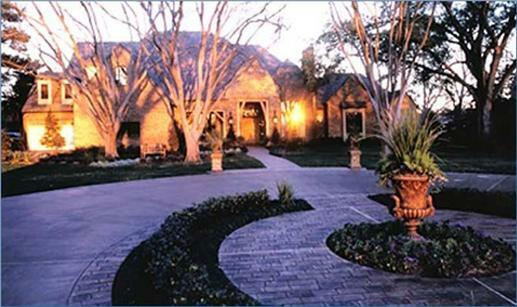 The stone fountain is the centerpiece of the landscaped courtyard entry (Plan #134-1326). Yes, it’s a castle-style home, but inside is a 21st century kitchen with a kitchen island, nook-breakfast area, walk-in pantry, peninsula-eating bar, and very modern appliances (Plan #134-1326). 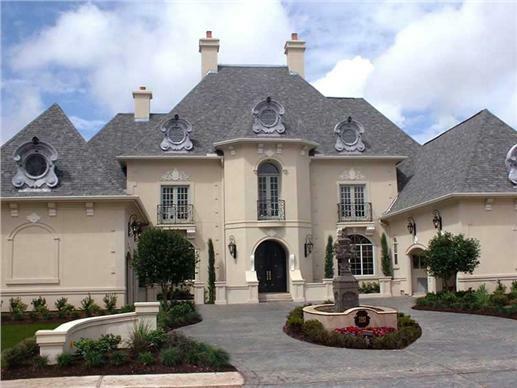 Who says you can’t have a Chateau-inspired home in a typical neighborhood? Built on a corner lot, this two-story, four-bedroom castle-like home—with its decorative chimney, asymmetrical, steep roof lines, spires, and lush courtyard—is delightfully appealing and charming (Plan #188-1001). Another modern castle-like home for the neighborhood: atop a hill—and with its tower, spires, arches, and front balcony—this home can transport you to the enchanting world of fairy tales (Plan #135-1216). Ah, choices, choices! 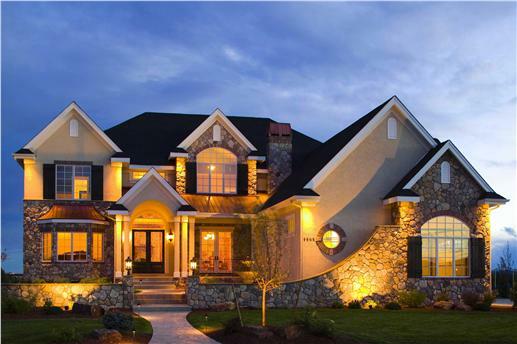 Are you ready to take the next step—and build your very own European-inspired home? 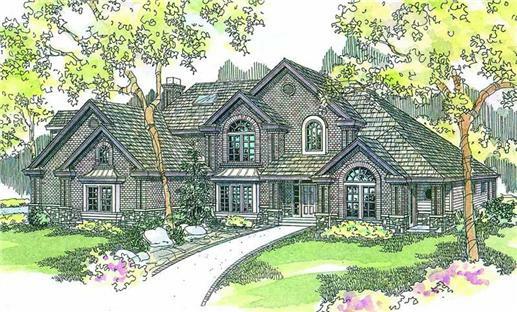 To get started, visit our latest collection of European house plans. Footnote: The lead image in this article is from a European-style two-story country home. For more details about Plan #101-1000, click here.